First up though, we need to get R4 (The Cisco router) configured and setup. 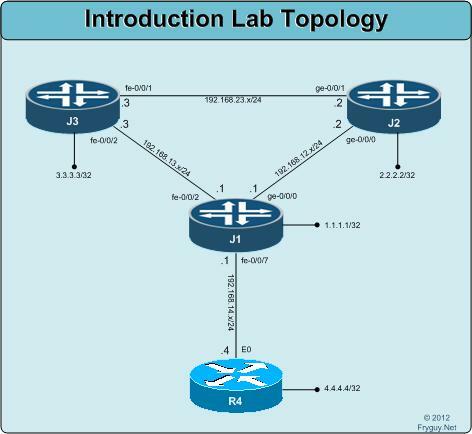 For R4 we need to configure E0 with an IP of 192.168.14.4/24 and the loopback with 4..4.4.4/32. Once we have it configured, we will save the config to FLASH as base.txt so we can reload it later on. Ok, I know I said I was done with the IOS XR stuff, but just had to share this. 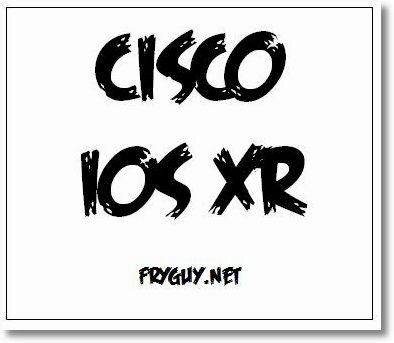 Cisco has posted some Videos on YouTube, they are below for your enjoyment. Also, if you are looking for an IOS XR book – here is a link to the one on Amazon. Guess it is time to get the party started! Just a quick note, there is a vendor that I have used in the past to get hardware for labs, if you are interested in hardware, please let me know and I will put you in touch with them. You can deal with them directly so that you know you are getting their best price. I am not going to cover how to recovery a lost root password, but if you need that information here is a link to the Juniper KB Article KB17565 below. This article is for Junos 10.x and higher. What I will cover though is getting your Junos device up and running after you recover the root password. First thing you will want to do is zeroize the device, this will erase all configuration information and reboot the device. Once the device finishes rebooting, you will be at the Amnesiac prompt. This is the prompt the system give you when there is no configuration on the device. Almost like is it brand new, out of the box!